[Snohomish, WA] – At 5:25 AM firefighters from Lake Stevens Fire and Everett Fire Department were dispatched to a report of a single vehicle that was rolled over into a ditch at the intersection of Home Acres Road and 51st Avenue SE. 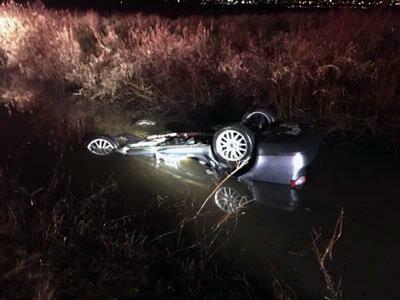 When crews arrived they found one car that was 75% submerged in water and it was unknown if anyone was still inside the vehicle. Lake Stevens Fire had one Rescue Swimmer part of their crew who was able to quickly enter the water. Crews broke the passenger side window and found that there was one victim trapped inside the vehicle. The victim was able to use a small air pocket towards the back of the vehicle to breath. Crews were able to break open the back door which gave the Rescue Swimmer better access to the victim, however, one leg was trapped making it impossible for the Rescue Swimmer to get her out. Firefighters ended up using their auto extrication tools underwater to cut the door off. Once the car was cut open the Rescue Swimmer was able to get her leg released and bring her out of the water. She was quickly back boarded and transported to a local hospital to be treated for extreme hypothermia. Due to the water temperature being between 40-45 degrees Fahrenheit, Lake Stevens Fire’s Rescue Swimmer was taken to a local hospital to be evaluated for mild hypothermia. Along with Lake Stevens Fire and Everett Fire, crews from Marysville Fire, Snohomish Fire Department, and Snohomish County Sherriff’s Office assisted with the very complex incident.